Robert manages a team of loan originators and wants them to actively connect with their top real estate agents but compliance is a big concern. Robert deploys RatePlug for his team. His LOs connect with their agents. Approved rates and products are now used to calculate monthly affordability on every connected agents’ MLS listings. Robert has more peace of mind around compliance because he can manage rates and products from a central dashboard. He can also manage branding as well as monitoring and measuring his LO activity and their new agent connections. It’s easy for Robert to elevate RatePlug to his executive team because more than 800+ participating banks, credit unions and LOs have reviewed RatePlug’s compliance and know it adheres to all regulatory guidelines. With RatePlug, Robert has found a 100% compliant solution. Agents get proactive support. LOs write more applications. Homebuyers know what they can afford. Loans close faster. The home buyer gets the perfect house. Manage real estate agent relationships at scale. Are you focused on increasing your purchase volume? Are you searching for a 100% compliant solution to build and strengthen relationships with real estate agents at scale? 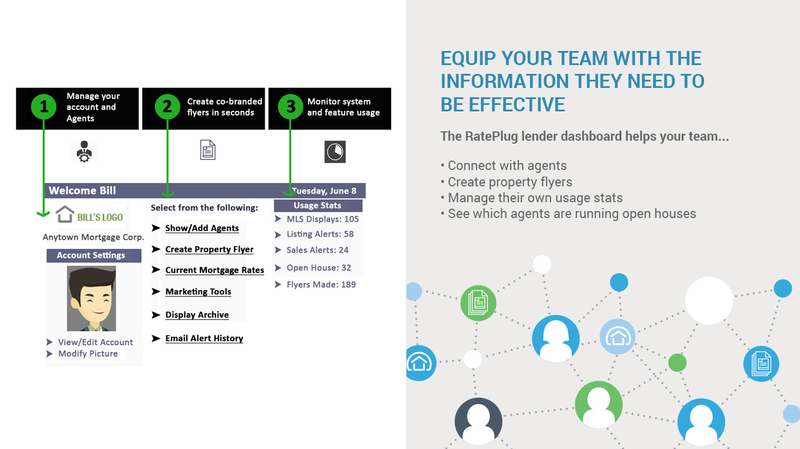 Whether you drive volume through a field organization or a call center, RatePlug connects you directly into the platforms your agents use to communicate with their home buyers. This exposure increases your capture and conversion rates and helps your lenders build stronger agent relationships at scale. RatePlug offers additional capabilities for driving revenue, improving automation, generating open house flyers, ensuring compliance, and measuring and managing the productive activities of your team. Want to learn more? Explore RatePlug’s features today. By helping your agents understand the “affordability” of the mortgage in terms of monthly PITI (principal, interest, taxes, and insurance) as well as HOA and other recurring costs, agents can better educate homebuyers and help them search for homes that fit within their DTI. This better qualifies lenders and protects your LOs from wasting time on applications that will get denied. To learn more, get in touch. The key to creating a sustainable call center strategy is to employ not only inbound calls, but an outbound call methodology that focuses on repeat referrals. Through measurable activity-focused metrics, you can identify best practices to increase your purchase production, regardless of the rate environment. Performance based feedback. You can now provide support for each originator at the branch level based on purchase efforts through Agent focused activities. For regional and national mortgage companies, we provide detailed metrics that share how many times your company, and each of your originators, has been viewed by home buyers and agents alike. Would your organization benefit from having more real estate agents aware of your company and your products? By sharing affordability that brands your company to each and every homebuyer we can increase your purchase volumes, and increase brand awareness. Schedule a conversation and learn how to enhance purchase productivity. Engage home buyers early in their home search to share special financing options that may be available to them. Through our unique integration process, we identify each property based on eligibility for USDA, VA, FHA, and Down Payment Assistance programs within specific census tracts. Our program is constantly vetted by our corporate clients to address the changing compliance landscape. Whether its RESPA, TRID or the MAP act, we have you covered. Ask about the Mayer Brown Findings On Rateplug's RESPA'S Compliance to Learn More. Property alerts prompt FHA compliance. Alerts notify agents when properties qualify for special financing (VA, FHA, USDA, CRA). Track Community Reinvestment efforts within LMI communities.